I’m not sure what to think of this Ebola thing. But clearly I am thinking. I wasn’t sure I wanted to write this (yet) for our fire wife community. But then decided I must. If it’s on my mind, and in my husband’s training at the fire department and all over facebook, then our audience is definitely thinking the same thing. 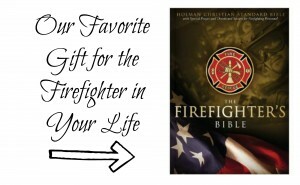 Quite frankly, I’m surprised the topic hasn’t yet been brought up in our private Fire Wife Sisterhood community. Perhaps we are all addressing it like I have been. It’s that thing we never wished for. It’s potentially so big and devastating I sort of want to pretend it’s not even happening. Right? I mean we’ve got an amazing life. My children are healthy and vibrant and the world is laid out before them. I don’t even want to process an invisible killer that could interrupt our life. But I have been processing. My mind has gone to the extreme thoughts of mass plague and rationalized all the way back to pull yourself together. Don’t be ridiculous. Don’t waste precious thoughts on what-if worries that are likely to never come to pass. Or are they? See this is where life isn’t so clear and simple. And our fast paced news stream world further clouds. How much worry is there? What does CDC really think? Actually, maybe who cares? I mean, will we really ever know the inner workings of those organizations? Maybe not. If they issue precautions, yes I’m going to listen. But I don’t have the brain power or experience to put myself in their shoes or President Obama’s or the airlines or government officials of any kind. That’s not my gig. For what it’s worth, here’s my best fire family two-cents. It’s what regular ole people like my husband and I are doing to face this challenge. I hope it brings confidence and peace and calm to your thoughts. Because no matter what the future holds, I do believe we want to approach it with a stable mind and the most helpful emotions for the situation. Cliche. For sure. But nothing truer when you’re caught up the creek without a paddle. So how should we prepare for this? I’m no doomsday prepper so just google that if you’re at that level of serious. I do think we should be monitoring the developments and considering some Plan B’s if things get out of hand. Want me to define my use of “out of hand”? For me that means, public buildings and public transportation shut down. Health care providers walk off or get put on lock down. Schools close. And in turn many commercial establishments shut their doors – restaurants, groceries, etc. Perhaps even home deliveries from Amazon stop *gasp*. And for a fire family…..could mean my husband is forced to stay at work. Or that we have some tough choices to make about the risks he is exposed to there. So how do we prepare? I don’t mean to create a mass milk-run but this might be a good wake up call to think about some long term clean water and food supplies. Or maybe I’m overreacting. Honestly we haven’t decided yet but I want you all to know you aren’t the only ones out there having these thoughts. And doing nothing definitely doesn’t qualify as preparing. If you aren’t a fan of doing a little extra preparation, then please do not sit around and do nothing but worry. Goodness that doesn’t do anyone good. Worry is absence of faith. If you lose faith that good things will happen, life gets pretty ugly. I’ve already had moments of paralyzing fear and grief when we sat and talked about the possibilities. This is not the life I want for my children. And I consider myself a pretty positive and driven person. This reaction sort of surprised me and I had to really reframe my thinking to get out of it. I’m not in denial…..no worries doesn’t mean blind ignorance and denial. (See above. Luck favors the prepared.) But we do have to stay focused on some hope and have faith. Whether you believe in God or fate, this is the reality of our world right now and we were made to be right here, right now. And I do believe we were made for good and to have an abundant and prosperous life, even though we may walk through some valleys. We do not walk them alone nor without help. So you’re not sure if you should prepare, you’re not worried and you’re monitoring the situation. Good. Here’s the next tip straight from Grandma’s kitchen table. Our world has become such a fine tuned sales pitch driven marketing machine. From politicians to religious leaders to business owners and yes, even right down to the girl scout leader and hockey mom who need a piece of your time to volunteer and draw you in with their adorable pinterest perfect proposals. The best critical thinking skill I ever learned in school was to analyze perspectives and viewpoints. I learned it in that 9th grade English class I dreaded but taught me to love William Faulkner. I learned it studying the past in AP American History. I learned it in the Women’s Studies class I thought I couldn’t wait to try in college. I learned it in bible study after bible study. And yes, I practice it now on social media. Before jumping to conclusions and biting on the hype, know the story behind the story. Where is the writer coming from. Who is their audience. So before you get all freaked out by something you read, seek some wise counsel. Talk it out with trusted, knowledgeable friends and don’t waste any energy on anonymous nobodies on the internet. Trust those who do know and are here to keep our world safe. First Responders. Many police and fire departments are already being briefed and trained on this topic and preparing to assist if things get worse. And of course hospitals as well. 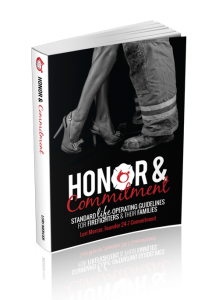 As a fire wife, I have some first hand insight into these trainings and it does bring me comfort to know this. Not everyone is going to do it right. There will be mistakes (as everyone is debating this week about who was the person and what was the policy that allowed that girl to board the plane from Dallas to Cleveland.) We are human and our systems and policies won’t always work. But I have no doubt there are intelligent people who have thought these scenarios through and I’m so grateful for their work. The process used in Winter Park was initially developed for the aviation industry during the SARS epidemic. It was designed specifically to globally disinfect a commercial aircraft in a way as to not affect the sensitive avionics (electronics). The AeroClave process utilizes a particulate hydrogen peroxide mist at an 8% concentration. This mist is circulated throughout the patient compartment over a 15 minute period. Once this process is complete the ambulance is certified to be 100% clear of any bacteria or pathogens. The CDC will not allow Ebola outside of a level 4 containment chamber, therefore the AeroClave system has not been tested on Ebola. However, the AeroClave process has been tested on pathogens much more difficult to kill than Ebola and has proved 100% successful with every test. We began our partnership with AeroClave 8 years ago to protect our patients and crews from any potential cross contamination. Our initial concerns were the potential spread of the seasonal flu, which the CDC estimates an annual death rate of 35,000. We are very confident our ambulances are the cleanest, safest and most modern transport units in the country. And here is a link to their press conference regarding this equipment. Now I know what you are thinking. That’s great for Winter Park but there’s no way our department can afford those. I get it. If these were affordable, they’d be all over the world cleaning up after all kinds of infectious diseases. I pray the technology continues to evolve to make that possible. And I pray for protection over all first responders and health care workers who bravely face this deadly disease head on. Moments such as these demonstrate superhuman feats in those professions. So, this isn’t easy stuff. But first responder and health care families especially are no strangers to this. When our babies were little, my husband and his partner were exposed to meningitis. I pretty much packed up and ran for the hills (AKA my mom and dad’s house) until he was clear of the threat. His partner wasn’t so lucky and was quarantined under the care of his mom and dad for a few weeks while his young family managed on their own. But there is one extremely different aspect with the Ebola. The 80% death rate. Yeah that. My regular person logic is that’s what makes people like the guy from Liberia who flew to Dallas ignore all wisdom and expose the world so he can see his family once again. Or the nurse who flew to Cleveland probably with similar thoughts as she is planning her wedding. Yes the protocols tell us to ask a patient if they’ve been in Africa, etc, etc. But if you have been, have the symptoms and are staring down death, what is going to make you tell the truth? These scenarios do things to our human thought process. My personal extensive experience with international travel just multiplies some of my concerns to the point that I don’t even want to share them here. I’ve been on 10 hour flights full of people from 3rd world countries. Health standards and care are a HUGE benefit to us in the western world. Praise God. I’ll just leave it at that. Thoughts get irrational Just like I’ve shared with you about my thoughts ranging from freak out to Pollyanna to realistic. So here is my final thought to bring you peace in this situation. God’s got this. (or believe fate if that’s what you chose but I’ve found God to be much more faithful than fickle fate.) Scripture has been randomly popping into my head (thank you Holy Spirit) about God being our shield, our protector, our mighty fortress and strong tower. He goes before us and defeats the enemies we don’t even know are there (i.e. germs). And He’s going to direct all the right people and resources in a way that will only bring good in the end. So whom shall I fear? No one. Ain’t nobody got time for that. Fear paralyzes and steals joy. Instead…..Prepare. Clear your thoughts. Seek wise counsel. And pray. And don’t forget the hand sanitizer. 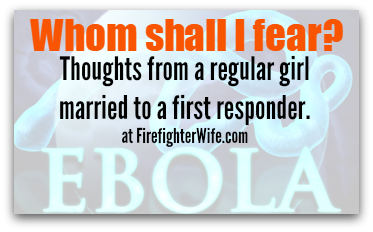 Just one view on Ebola from a regular girl married to a first responder. I pray mostly that we’re all overreacting and I don’t need to write another word about this topic. Either news has seemed to die down or I’ve continued to block it from my brain. Could be the latter as I truly do not watch television, nor troll facebook casually very often (in case you were wondering, facebook seems to have determined I only talk to fire wives, who are pretty awesome wonderful people, but makes me need to seek out other news stories and perspectives!). I think this is a good sign but why believe me because I’m just another person with an internet platform, right? Here is why I am feeling much more comfortable about this topic. Finally an intelligent news report, from a knowledgable individual with no need to position himself for an election or have any kind of stake in the game. This is the brainiac guy whom I want to be thinking through these scenarios for our country and world. Amen? Post by KWQC TV-6 News. Can I get an amen? I thought so. Still praying. Enterovirus, flu season and lots of other nastiness that our first responders and medical workers come in contact with. Thank goodness for our first world means to keep our country safe. Love. Love. Love. You got it right, Lori! Great article and good timing, as it has been brought to Ohio! Thank you Lori, very well spoken especially that very last paragraph, God does have this, so we just have to trust in him to lead us through this!! Thank you for helping me release some pent up fear about this! Well-written !